Most of the research projects for which there are files in this series were started in the 1970s to early and mid-1980s The remainder of the series consists of files for other research projects started in the later 1980s, as well as a smaller number of files for projects started after that time that were maintained by the Research Administrator. The series is arranged in four parts. The first three parts cover overlapping time periods from 1969 to 1995. The fourth part of the series is a research project file for the City Project or City Study (1975 - 1985). The majority of the projects in this series fall into the categories of development policy and planning, international finance and trade, agriculture and rural development, industry, transportation, water, telecommunications, energy, urbanization and regional development, and population and human resources. Some of the projects were conducted in collaboration with bilateral aid agencies, outside research institutions, and government agencies. The earlier projects were funded wholly or in part from the External Research budget (ERB) and the later projects by the Research Support Budget (RSB). The Development Economics Department (ECD), Development Research Center (DRC) and the Economic Analysis and Projection Department (EPD) were responsible organizations for most of the earlier projects with Sector and Regional organizations bearing responsibility for the remainder. Research project proposals for the later period were forwarded by the Development Research Department (later the Country Economics Department) or another department, a Sector, or Regional unit, or, in the case of jointly sponsored projects, by a department or Sector and a Regional unit. A typical research file contains: the formal research proposal submitted on a standardized form and sometimes accompanied by a narrative description of the proposed research and methodology; a memorandum establishing the membership of the review panel; comments on the proposal from Regional or sector units; the report of the review panel; replies from the reviewers or from the review panel; minutes of the Research Committee meeting at which the project proposal was reviewed;a memorandum containing the Research Committee's decision for funding and the identification code (RPO number) assigned to the project; quarterly status reports submitted on forms or narrative progress reports; and an abstract of the project that was published in the World Bank Group Research Program that was first issued in August 1972.The abstract described specific objectives of the study and the research method, the organization of the project, the date when final output was expected, and the Bank staff involved in the project. Also part of the project file were Terms of Reference and Back-to-Office reports for missions connected with the project; correspondence between the project supervisors and the Research Administrator that may include requests for additional funding (which were sometimes accompanied by an additional project proposal) or for an extension of the completion date; budget tracking reports; a project completion report on a standard form; and project evaluation reports from internal and external reviewers that accompanied the final project evaluation, or a project evaluation report from an internal panel. Files for some of the earlier projects also include correspondence with evaluators of the project, comments from the evaluators, and the project manager's response to the evaluations. Occasionally, completion reports and evaluation reports for more than one project were combined and some files are without completion reports. Internal and external evaluation reports as well as REPAC evaluation panel reports are in some files. 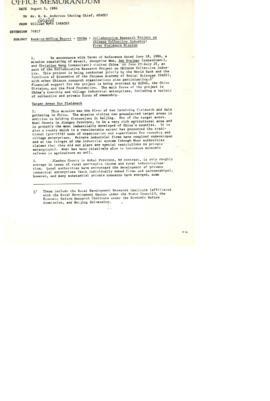 After 31 July, 1984, only projects receiving over $100,000 in RSB funds were required to be evaluated. Some project files for the mid to late 1980s contain proposals in the form of memoranda or papers for funding from RSB small grants (usually under $20,000) for development of formal project proposals; preparation of papers for colloquia; organization of workshops, seminars or expert meetings to assist in the formulation of a formal research proposal; or for dissemination of papers or other output from previously conducted research projects. The proposals for funding from the small grants program were usually reviewed and approved by the Research Adviser (later Research Administrator). The other research files for this period for projects requiring larger amounts of funding from the RSB vary in content. All of these files contain a completed Request for Research Support Budget (RSB) funding which is often accompanied by a memorandum describing in some detail the proposed research and/or methodology. Sometimes revisions were made to the original proposal and additional request forms were completed. All of the files contain an identification or RPO number. Among the more widely known of the early files in this series is a project file for what was in 1987 the longest running (18 years) research project in the Bank's history-Road Construction, Maintenance and Vehicle Operating Cost (also known as the Highway Design Study') (670-27). The International Comparison Project (670-68) was begun by the United Nations in 1968, was later funded as an external research project by the Bank, and was closed in December 1984. The Strategic Planning to Accommodate Rapid Growth in LDC Cities (The City Project or City Study) (671-47) project file covers the 10-year period from 1975 to 1985. In addition to the project completion report and evaluation, the file includes a November 1982 narrative report entitled The City Study: A Summary of Results and Policy Implications prepared by Gregory Ingram, Alvaro Pachon, and Jose Fernando Pineda. Another project file for the same project (RPO 671-47) contains manuscripts of some of the project papers and intermediate papers produced. According to the Project Completion Report filed by project manager Gregory Ingram, the intermediate papers were a means of compiling intermediate, mainly descriptive, results and usually resulted from the city study workshops. The project papers were usually more analytical and intended as finished results. These were intended for wide distribution and have mostly been published as World Bank Staff Working Papers or papers elsewhere in journals and books. Paper abstracts are in this series along with the manuscript of the monograph Understanding the Developing Metropolis: Lessons from the City Study of Bogota and Cali, Colombia by Rakesh Mohan, which was published in 1994 and summarized the main findings of the City Study. Also found with the earlier files in this series is correspondence of Ernest Stern, Senior Adviser, Development Policy with the Ford Foundation, the Rockefeller Foundation, the International Development Research Center (IDRC), the U.S. Agency for International Development (AID), and other government offices following the social science research on development conference in Bellagio, Italy, 13-15 February 1974 (RPO 670-92). The correspondence primarily concerns the continuation of international collaboration for development research and planning by holding meetings (referred to as Bellagio Plus meetings) during 1974 and 1975 in the areas of employment, income distribution, rural development, population, and education. Correspondence concerning planning and outcomes of these meetings is in the files along with correspondence of Benjamin King, Research Administrator, and Orville Grimes, Secretary to the Research Committee, with IDRC concerning Bank participation in the Social Science Research (SSR) information system and with Bank officials concerning the issue of Bank participation in DEVSIS, an international information system in the field of economics and social development sponsored by IDRC, ILO, OECD, UNDP, and UNESCO. The earlier files also include documents brought together for the World Bank's Comparative Study of Poverty (673-73), an overall study and evaluation of poverty, equity and growth in 21 developing countries during the period 1950-1985. Included are unpublished papers concerning Ghana's agricultural commodity prices, political economy, and production costs for food crops; studies of poverty, equity, and growth issues; various development plans and reports, including World Bank reports; study outlines; notes and correspondence concerning project work; and newspaper articles pertaining to Ghana. With these documents is a heavily annotated typewritten timeline of economic and political events in Ghana from 1874 to 1983 that was used in the study, a sample questionnaire, computer printouts, and related correspondence. Research papers on the Political Economy of Poverty, Equity and Growth in Brazil, Mexico, Colombia, Malawi, Hong Kong, Thailand, Sri Lanka, and Malaysia developed for the study and several comparative research papers; printouts of computer data; and a draft introduction prepared for a multi-volume publication of the research papers developed for the study are part of the files. For the later period the series includes project files for several multi-country Comparative Studies. The Timing and Sequencing of A Trade Liberalization Policy was the first of these studies that was initiated under a Research Policy Council program in 1985. An evaluation of the Comparative Studies was summarized in the FY 93 Report on the World Bank Research Program. A small number of project files for the later period were created for administrative purposes and assigned RPO numbers. Files are included in the series for projects that extended beyond their authorized duration and never went beyond initial planning stages and projects that were cancelled because no contract was signed or funds expended to carry out the project. The titles of some projects were changed after approval of the research proposal and a few projects were shut down and never completed because of lack of department or division sponsorship or because no work was undertaken after the project proposal was approved. Records are arranged in four series. Series one through three are arranged by time period (1969 - 1988, 1979 - 1990, 1979 - 1995) and further arranged and numbered in chronological order by date of research proposal with some exceptions. The fourth part of the series (Abstracts and Manuscripts of Papers Produced for the City Study Research Project [RPO 671-47], 1975 - 1985) is arranged by title with abstracts filed at the beginning. Records of the Office of the Chief Economist -- Records of the Economics and Research Staff (ERS) -- Research Files of the Economic Analysis and Projections Department (EPD) (WB IBRD/IDA DEC-02-05). See Records of the Office of the Chief Economist -- Records of the Office of the Vice President, Development Economics and Chief Economist and Later Senior Vice President, Development Economics and Chief Economist (DECVP) -- Project Managers' Research Project Files (WB IBRD/IDA DEC-03-76) for files that are missing from this series (includes RPO 670 and RPO 671). Also see Records of the Office of the Chief Economist -- Records of the Office of the Vice President, Development Policy (VPD) and the Development Policy Staff -- Correspondence and Files Created for Research Projects in Support of Operations (Operations Policy Files) (WB/IBRD IDA DEC-01-02) and Records of the Office of the Chief Economist -- Records of the Office of the Vice President, Development Policy (VPD) and the Development Policy Staff -- Correspondence Concerning the World Bank's Research Program (WB/IBRD IDA DEC-01-03) for related Vice President, Development Policy correspondence .